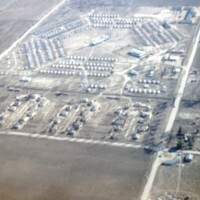 Another early aerial view of Linnell Camp in the winter. 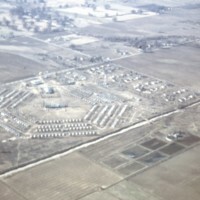 The water tower is discernable in the center of this picture. 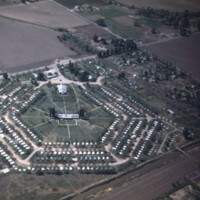 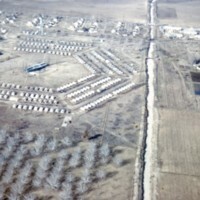 Another aerial view after the camp had been open a few years. 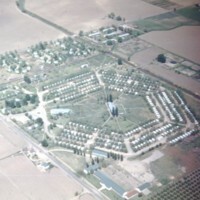 The Community Center is located near the entrance and the Utility Building is in the center of the hexagon. 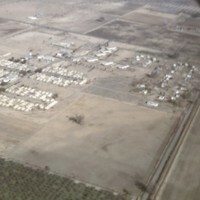 Woodville Camp Is located northwest of Porterville on the corner of Road 192 and Avenue 160. 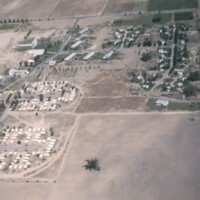 The small town of Woodville is a few miles west of the camp. 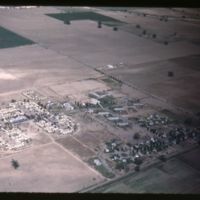 The Vincent School is the L shaped building at the top of the photo on the left side, and the Health Center building is located on the east side of the curved street on the right side if the photo. 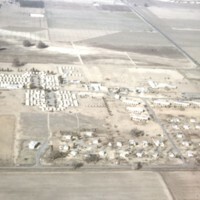 In this aerial view of Woodville the water tower stands out by the cabins. 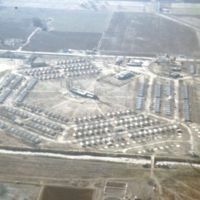 The homes are located at the left hand corner.